A highly robust 30cm (12") wide jumbo toilet roll dispenser. Manufactured from stainless steel the dispenser features a key lockable mechanism that helps reduce pilferage and vandalism. Suitable for use in schools, hospitals, public washrooms and any other high frequency executive and prestigious washrooms. 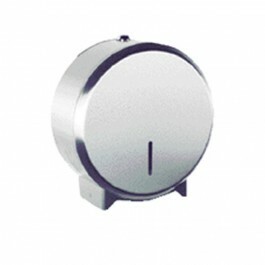 This is a stylish, polished, stainless steel jumbo dispenser with each unit incorporating a mounting bracket to fix to the wall with a key locking mechanism. A variety of paper cores can be accommodated, within the dispenser, from 48mm up to 76mm. Height - 323mm Diameter - 323mm Depth - 125mm. A variety of paper cores can be accommodated from 48mm up to 76mm. Recommended installation height 75cm from the floor. Viewing slot enables people to see how much of the toilet roll is left in the dispenser. Comes complete with key and fitting kit. Unlock dispenser and insert a new roll as and when needed.